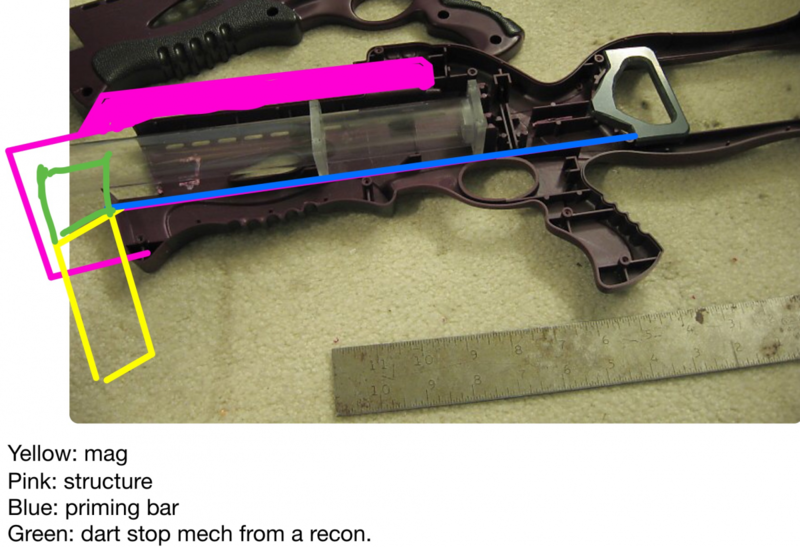 I have been studying CaptainSlug's Caliburn homemade, how nerf clip fed blasters work, and how we could make a clip fed nerf crossbow. Several people will say "we dont need this" and "this isnt an improvement", and they may be right. However heres what I put to them: Imagine a 35 round drum in a 95 crossbow. I dont know about you, but I think that would be at the least cool, if not badass. There is certainly more then a few problems with getting a clip onto this icon, so lets list them step by step. 3. Acessing the mechanism to make repairs: there is no doubt that this idea would need an occasional fix. We could use screws if we wanted, or maybe we could use one screw then the whole thing comes off the crossbow. Advice needed on this. 4. Materials and production via a guide: I was thinking delrin, aluminum, or ploycarb for the case of the inner mechanism. However I dont have experience in deciding materials, so advice needed here too. This whole project is in the design phase, not in the prototype phase yet. So any advice/input/help is thanked and will be looked into. The layout of the crossbow isn't compatible with this. Pull-back designs in general just aren't. You would end up with an extremely long blaster even if you figure out how to get everything to work. Caliburn is 31 inches long, but it saves 12 inches in length by having the plunger catch in the stock. We could use a system like the electric eel or the sawtooth (if weight restrictions agree with us.) the already posted diagram would still work with this. Edited by Silly, 27 February 2017 - 01:33 PM. It would still probably end up as a confusing system of gears or pulleys which chances are would not be worthwhile other than to show that it can be done. And I highly doubt it'd ever be a good/safe idea to have what is essentially an upscaled Sawtooth or EE but with a more dangerous spring causing probably structural damage relatively fast. Edited by PraisinBran, 27 February 2017 - 01:38 PM. Both these blasters work in a very different way than any modern clip fed blasters. Instead of chambering a dart from a clip into barrel, the clips on these blasters ARE the barrels and get whole clip is advanced up or down via a tooth. Your visions of a 35rd drum couldnt really be acomplished with this style. Those visions would be abandoned with the EE ST design. Similar to how the koosh vortex tornado used a priming handle that pulls the rod back, but isn't attached so it can for forward again could we put a long notch on the priming rod? Kind of like how the dart zone Magnum works? 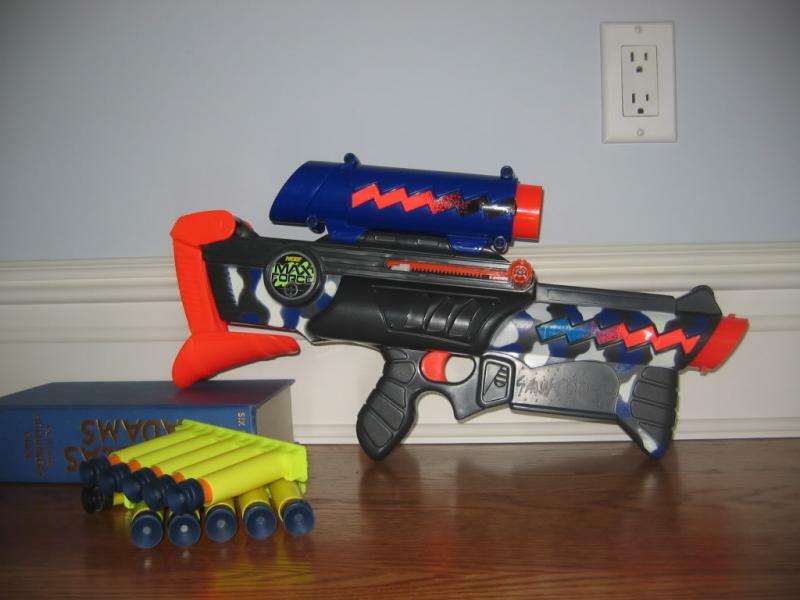 That's how the old deoderant-clip Big Bad Bows worked, and the newer Pump-Action Shotgun mods. Edited by aydensnake, 08 May 2017 - 12:06 PM.